Extra thick. 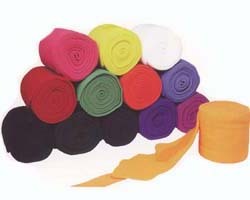 5" x 90"
Four extra thick poly fleece wraps. Requires no padding. Can be used for exercise or shipping. 5" x 90". Available colors: BLACK, BLUE, BURGUNDY, HUNTER GREEN, LIME, NAVY BLUE, PERIWINKLE BLUE, PURPLE, RED, WHITE.